Re-graphics stretch your budget with replacement graphics on your existing hardware. We will send you an artwork template or produce artwork for you. Then you send us your hardware and we will do the rest – including some free expert TLC if needed. Replacement graphic for fabric displays, flags etc. £109.00 need help? contact us! New panels complete with rails. Just swap them over. £70.00 need help? contact us! New graphic panels for the pop-up frame that you already have. £110.00 need help? contact us! Fresco’s re-graphic service is a green and cost-effective alternative to ditching your trusty display. 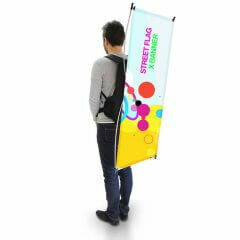 We can in fact fit a new print into almost any kind of portable display. 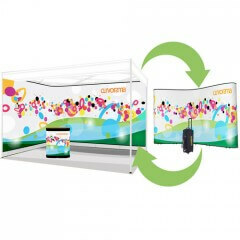 Established in 1993, Fresco sells good quality portable displays at the best possible prices. All our displays are backed up by helpful support. All of our stands are printed and finished in the UK. Our premium quality printing uses the latest print technologies. 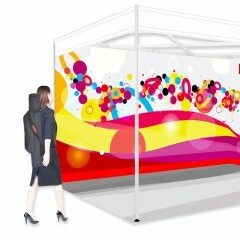 Fresco can meet the tightest deadlines on exhibition displays with our broad in-house capability and wide experience. Fresco’s range of exhibition and outdoor displays offers solutions for everyone. 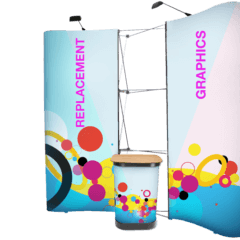 Fresco is a leading UK supplier of all types of portable exhibition displays and designs and manufactures our own unique backdrop display stands such as Curvorama and ShowSuit. We do not sell the very cheapest stands as we assume our customers will want to look their best at an event. Our display stands do not compromise on quality and nor does our display print . Because we do all our own colour profiling you can be confident about your image. Send us artwork or take advantage of our very experienced team and use our design service. Alternatively send us resources (logos and so on) and we will artwork them for you – a very cost-effective option. We are flexible and whatever suits you, you will find Fresco responsive, helpful, expert and a pleasure to work with. We offer free technical support for your own designers to produce display artwork that will print perfectly. This helps us and it helps you – your success is our success. Standard turnaround time is 5 working days (from pdf proof sign-off) but we can do it faster if necessary with a 10% rush charge. Fresco bends over backwards to make sure your display gets delivered on time, every time.